Bossy Italian Wife : Spicy Meatball For President! It's election day and that has my appetite all worked up. Yes, I am going to vote. No, I am not going to tell you who for. What can I tell you is that in the meatball department, I have a great candidate that I think you will find quite awesome. He reaches across the aisle, pleasing both Democrats and Republicans. He really satisfies and gives more than he takes away. How could you not love Spicy Meatball?! Join me in the battle cry from kitchens everywhere: Spicy Meatball, Spicy Meatball, SPICY MEATBALL! Yes, you guessed it, we're making meatballs. Spicy ones. Because today's election calls for some balls. We don't have a huge amount of ingredients, but they pack a wallop! Garlic, eggs, red meat (I used venison), 1 package of hot Italian sausage, parmesan cheese, bread crumbs, red pepper flakes, oregano. So you take your package of sausages and you are going to remove the casings. This might sound intimidating, but it's election day--nothing should intimidate you today. Take a knife and boldly slice through the sausage skin. Discard the casing and put in a large mixing bowl. Then your pound of red meat. You can use a variety of meats here. You all know me, I'm a venison gal. But you could also use veal, bison, beef, or lamb. Four large sized cloves of garlic, minced. Ready to really give these meatballs a POW of spice? A tablespoon of red pepper flakes should do it, huh?!?!? And a tablespoon of oregano! Some pepper. Your choice how much. I'm generous with it. Okay, we're looking good. But more than anything, the most important piece is how we are going to mix it... and you know what I'm gonna say. 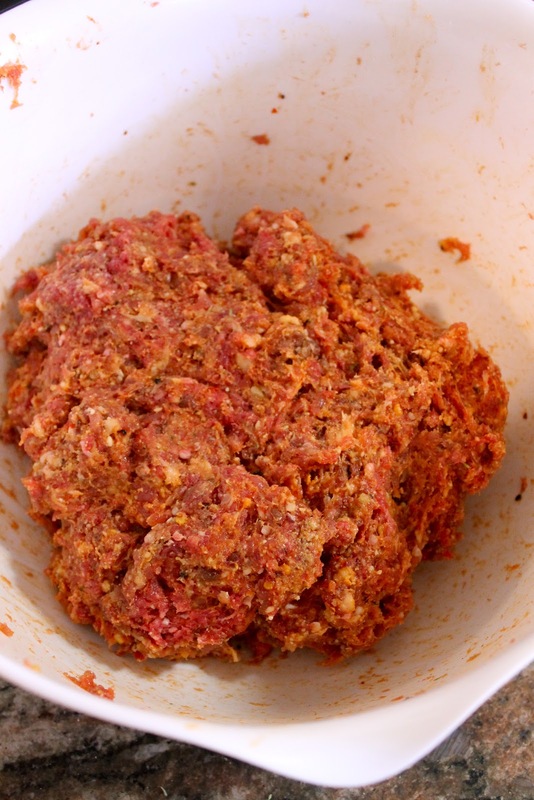 There is only one way to mix the perfect meatball--spicy or not--and that is with your hands! So dig in. And if you are less forgetful than me, do try to take off your wedding ring. Sheesh! It's looking REALLY MIXED UP! And now, my friends and fellow meatballers, we are ready to roll our balls. Just to give you an idea about the size of the them, specifically. Some people like really big meatballs (like my Uncle David, for instance) but I like them smaller. This is because I like to feel like I can eat more of them. So that's how I roll. Okay, now we are going to throw these babies in the oven on a HIGH BROIL for 12 minutes. The 12 minutes part being important. How's that for an outer crust! And seriously, I wish you all could have been in my kitchen because the smell? Divine! Now it's time to plop them in the sauce. My sauce has been simmering away, but if your sauce is cold or canned, it's okay. That is a loaded batch of sauce and spicy meatballs! Stir your meatballs into the sauce and then bring the whole big thing to a boil. Once it's boiling, you are going to reduce the heat and cover, simmering it for a couple of hours or until you are ready to serve!! Easy, right? Almost as easy as voting...which I KNOW you are planning on doing. Spicy meatball, I love you. If you were eligible for election, you would be my first choice!!! Bossy Italian Spicy Meatball Recipe! *A pot of pasta sauce. I recommend "The" Marinara sauce, but you can use canned, or whatever your favorite recipe happens to be! Prepare a large sheet pan by covering it with parchment paper. Set aside. Prepare your sauce by placing it in a large pot and getting it heated on the stove. I like to cook mine a day ahead and then place it on the stove to simmer, covered. 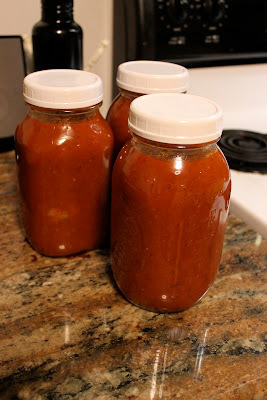 If you are using canned sauce, you can just add it to the pot, cover and place it on low. Prepare the sausages by removing the casing. To remove the casing, run a sharp knife along the sausage to make a split in the skin. Remove the meat from the casing and place it a bowl. Discard casing. In a large bowl, add the rest of the ingredients with the sausage. Using your hands, mix it all together until FULLY combined. Roll into palm-sized meatballs and place them on your prepared sheet pan. You should get about 24 meatballs. Place the meatballs in the oven on a high broil for 12 minutes. This will brown the meatballs and keep them from falling apart. And make your kitchen smell amazing. Remove meatballs from the oven and place them in the pot of sauce. Stir them into the sauce, and bring it all to a boil. Once the sauce and the meatballs are boiling, reduce the heat to low and cover. Simmer for about 2 hours or until you are ready to serve. Serve over pasta with parmesan cheese!!! YUM! Your recipe is the real stuff - only better - and that from Anne Marie Del Vecchio!!! Love it!! !